Percy here. I’m the “other” dog, as the black Lab calls me. I joined the family two years ago. 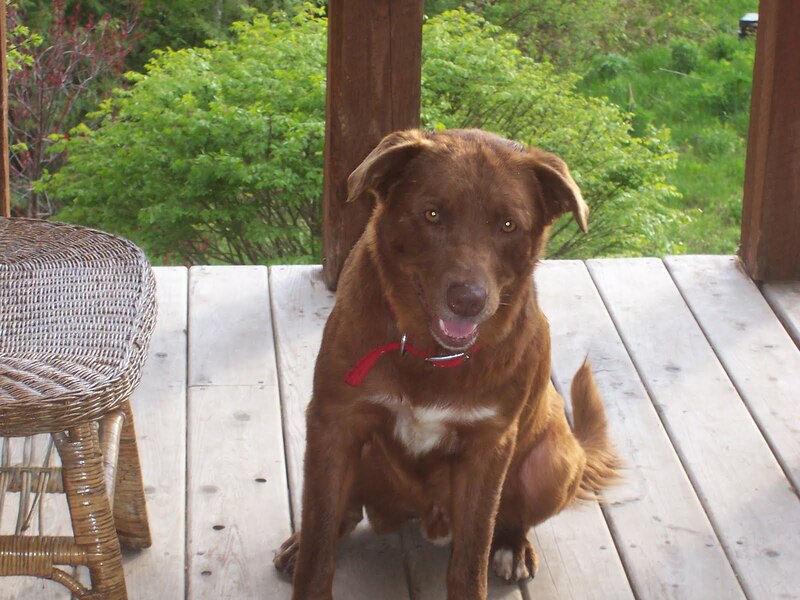 I had been sitting on death row in Florida waiting for the deadly needle when Chesapeake Safe Harbor in Maine offered to take me because the guy who dropped me off at the shelter said I was a Chesapeake Bay Retriever. I gotta say that’s stretching it a bit. Granted, there’s some Chessie in me, but it takes a good eye to see it. I made sure to behave on the long relay ride up the East Coast. Every driver praised me. Let me tell you, I learned through the school of hard knocks when to be an exemplary example of a good dog. It’s saved my life more than once. Now that I’m secure in my new home, I slip a little, but I’m a quick thinking animal and figured out how to gloss over my errors. When we're on a walk and the woman starts her “bad dog” routine, I hang my head in shame and come to her. Then I heel all the way home. Works like a charm. By the time we get to the house, she’s forgiven me. I waited six months before I got on the furniture. She tried to break the habit, but eventually gave up. I knew she would. So the black Lab sleeps on the floor and I get the couch. SWEET DEAL. Got to admit it’s hard to put up with the black dog. He still thinks he’s a puppy and runs circles around me, nipping at my ears because he wants to play. I’m too old for that crap. I do my best to ignore him, but sometimes I lose it and drag him around by his collar. That doesn’t go over well with the woman. The day I arrived at my new digs, I couldn’t believe my luck. Two fur balls sat on the porch. In my world, god created cats for dogs to chase. I jumped outta the truck and took off like a jet fighter. Surprise! They didn’t run. A look passed between them right before one jumped on my back. The other landed on my head. Thank god, the man and woman rescued me. I learned a lesson that day. Never tackle both cats at once. I bided my time. Waited until I caught the BIG one walking down the driveway alone. Before the woman could yell my name, I was gone. I thought it was my lucky day ‘cause the monster ran in the woods. I tore after him. Then he stopped short. I plowed into him and all hell broke loose. That was the day I decided to leave the cats alone. I don’t like them, but it looks like they aren’t going anywhere. Gotta respect their determination though. They should be declawed. Then I might stand a chance. Until the next time…hope you get to gnaw on a lot of marrow bones. Percy sounds quite a character! I'm glad those "fur balls" stood up for themselves. But I can almost see the wheels spinning in Percy's head, waiting for the next opportunity. LOL! Too cute. It sounds like you've landed in quite the house Percy. Glad to hear the cats can hold their own though. My name is Junior and I am a spoiled brat. I think that your doggie needs more toys and chews. We like when they are everywhere, balls to chase, and fur toys to snuggle. That's just my opinion. My mom doesn't agree. Hey Junior! I've toys, but I only want to play with them when the black dog wants them. I'm really too old for toys. I like the real thing. Sassie here. Just thank your lucky stars for the black dude. I lost my best friend a little while ago and it's really lonely when my lady goes to work. She keeps talking about Mishka, but who the heck is that??? I'm hoping it's somebody smaller than me who loves to play. I Cassie and I don't remember how I came to the Middle Tn Sheltie Rescue. The tell me I was too fat! AS IF! I have to admit I love my food. In spite of having a warm place to sleep and other shelties to play with, they STARVED me to death. I went from 27 lbs to 20 pounds when my wonderful mom picked me up. And guess what she starves me too. I now weigh 17 lbs, and she keeps reminding me I'm a tiny sheltie (13 inches) and don't need all that extra weight. She says I'm supposed to weight 15.5 lbs. AS IF! If I gaze at her meaningfully she'll give me a third of a Pupcorn treat. Man is she stingy with those. I have to admit it's a lot easier to hop up on the couch now that I'm so svelte. I love to play and race around the fenced backyard. There aren't any other pets for me to contend with and there are squirrels galore to chase. Haven't caught one yet, but I keep trying. When I'm in the house, you can find me on the sofa or chasing a tennis ball. And get this--I sleep on mom's bed everynight. I've got it good in spite of the food issue. I have my own Twitter account. @cassiesheltie is where I hang out. Very cute blog! I'm forwarding the link to my kids and friends.